This beautiful camera was built where the space age was at its highest peak and it shows. Beautiful black lackered metal with bare silky smooth aluminium. The camera is pretty heavy and has the light meter cells around the lens. The winding lever is unsually placed at the bottom left of the camera body, which takes a little to get used to but as it's moving towards the front, you will get used to it pretty quickly. The back can be opened by sliding down the lever on the right hand side. The range finder shows a small yellow spot in the center of the view finder. All Zorkis from before the Zorki 10 were more-or-less close copies of German Leica cameras. The number 10 was actually a close copy of a Japanese camera, the lesser known Ricoh Auto 35 and was a major change of the former Krasnogorsk camera products. Diese sehr hübsche Kamera ist in neuwertiger Zustand und es sieht auch ganz danach aus dass sie, über 40 Jahre alt, noch funktionieren wurde. Allerdings hatte ich bis jetzt keine Zeit sie aus zu probieren, wirklich schade weil es wirklich ein schönes Stück ist. 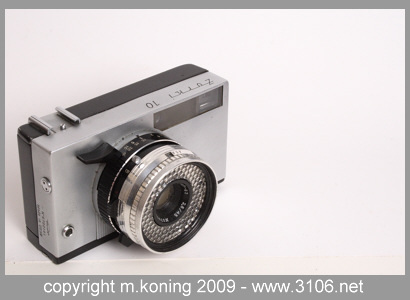 Teils ist sie aus schwarzer Kunststoff aber der Rahmen sowie Vorderseite ist aus dickes Aluminium gemacht und deswegen ist diese Kamera auch ziemlich schwer für seine Größe. Auch im handling ist Sie ziemlich eigzigartig aber es hat alles seine Berechtigung. Diese Kameras wurden in 1967 produziert und deswegen sieht sie auch so Space-Age mäßig aus. Sehr schön! Viewfinder : Bright finder with yellow spot and bright parallax markings. Shutter : Leaf shutter. 1/30 - 1/500 second. Aperture : f/2.8 - f/22. Flash : X (electronic flash) and M (bulb) settings. Cold shoe on top of the camera. Flash Contact : Contact next to the lens barrel. Film Advance : Manual, single stroke using lever at the bottom of the camera. The left hand winding with push mechanism towards the front need a little getting used to but works quite well. 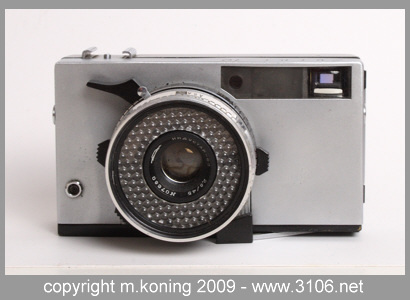 Film Rewind : The film rewinding wheel is located at the bottom of the camera. There is a little wheel with engraved ribs. Turn this wheel counter clockwise and the thumb wheel falls out and can then be turned easily. As soon as the film has been rewound, turn the wheel clockwise and the wheel disappears again. Film Counter : Is located at the bottom of the camera. How to open the film compartment : switch lever at the bottom left hand side to the O position and push. Extensive information at Alfred Klomp's Website including production figures. Read the manual at the Zenith Camera website.